'Kemp's Walk'. 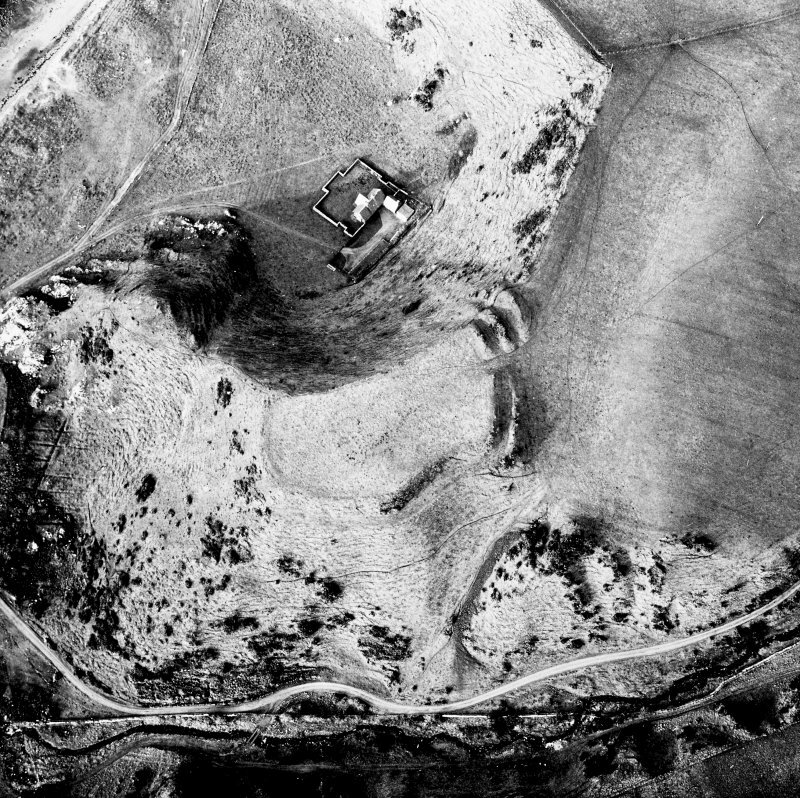 A fort occupying a large promontory, probably defended by a continuous wall or rampart with an outer one to the north, east and south of it. The main defences lie to the north or landward of the fort where the inner and second ramparts are accompanied by external ditches and are strengthened by the presence of a third rampart and ditch. There is an entrance towards the east: the outer rampart and ditch do not continue east of it. 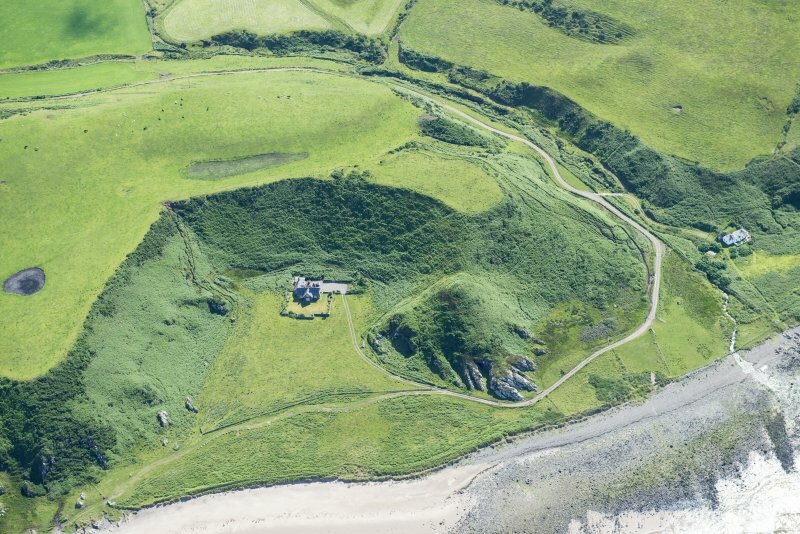 This large fort is perhaps not typical of the Galloway promontory forts, but mere absence of erosion may be the explanation in part of its apparently extraordinary size. The hillock (NW 9744 5983) which is connected on the east to the fort by a narrow neck appears to have been the site of a hut circle. This promontory fort is as described by Feachem. There is a small mutilated hollow on top of the conical hillock at NW 9744 5983 but it appears to be natural: there is no other evidence of a 'hut-circle'. Revised at 25". 'Kemp's Walk': anglicised by (Ainslie and) the original OS surveyor to 'Kemp's Wark'. 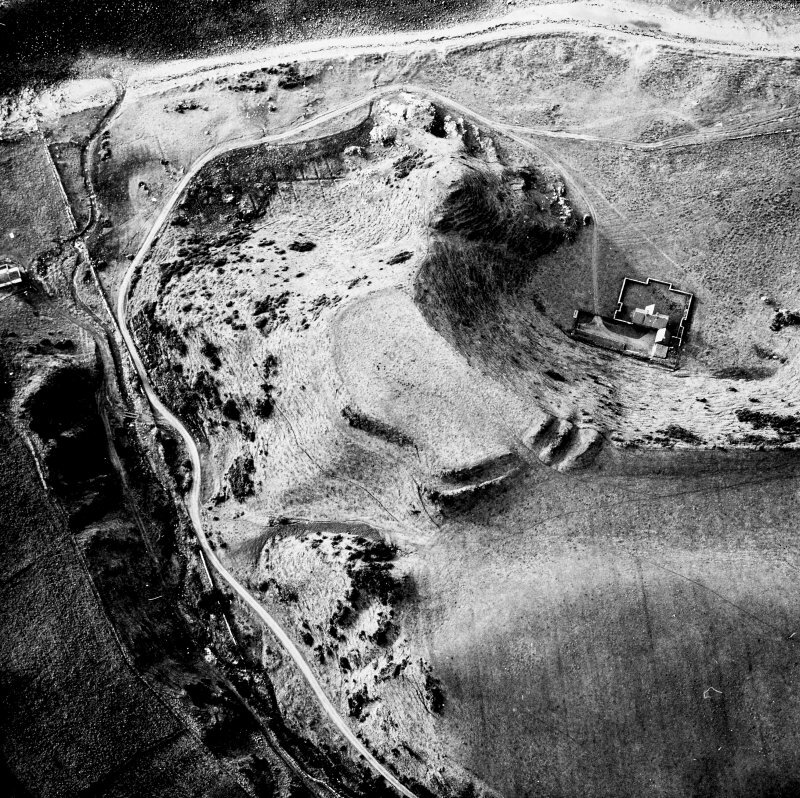 This fort, which measures 83m by 44.5m internally, is situated on a promontory on the degraded cliff-line about 500m WSW of Little Larbrax farmsteading. 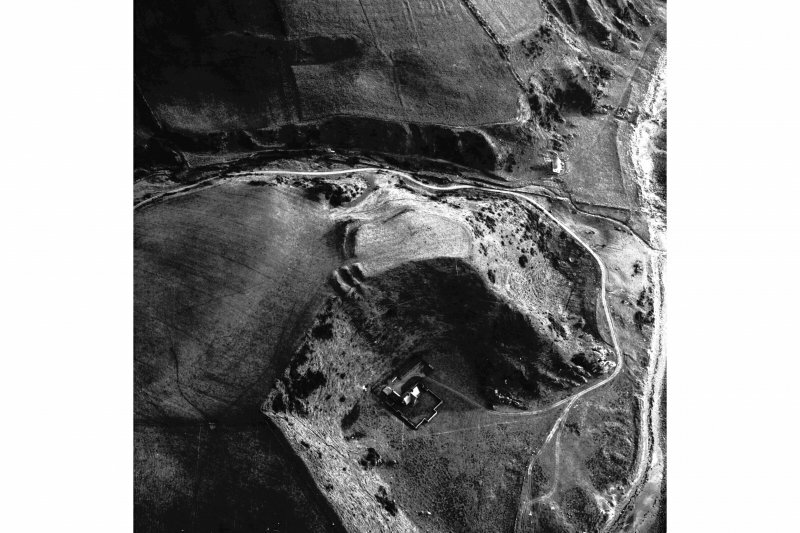 The neck of the promontory was cut off by multiple earthworks comprising three ramparts and two ditches to the NW of the entrance and two ramparts with a medical ditch to the S; the E flank may have been protected by the continuation of the twin ramparts but all trace has been removed by a modern pathway which leads from the entrance to the tip of the promontory. 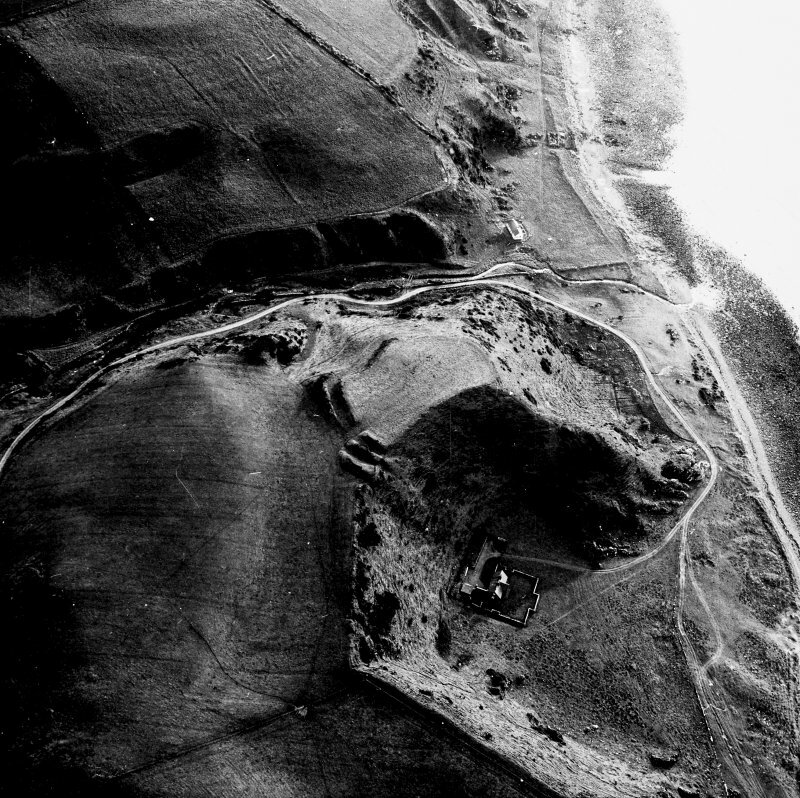 There are no remains of ramparts above the steep slopes on the S and W.
RCAHMS 1985, visited February 1985. This site was included within the RCAHMS Marginal Land Survey (1950-1962), an unpublished rescue project. Site descriptions, organised by county, are available to view online - see the searchable PDF in 'Digital Items'. These vary from short notes, to lengthy and full descriptions. Contemporary plane-table surveys and inked drawings, where available, can be viewed online in most cases - see 'Digital Images'. The original typecripts, notebooks and drawings can also be viewed in the RCAHMS search room. Information from RCAHMS (GFG) 19 July 2013. Overlooking the sandy expanse of Broadsea Bay at Larbrax, 'Kemp's Walk' is the largest and best preserved of the promontory forts of western Galloway. 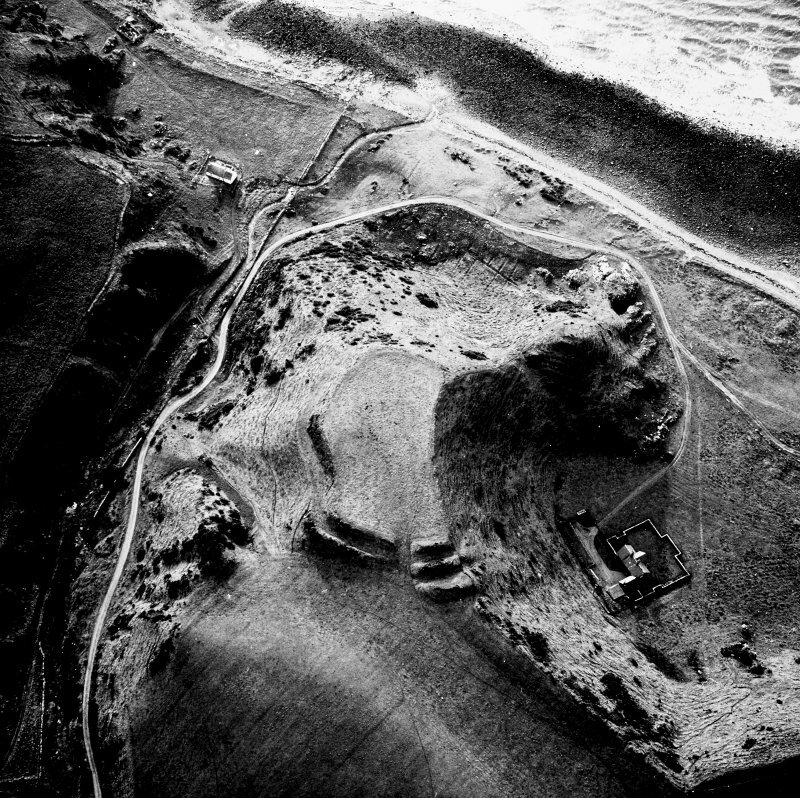 On the west side of the northern and only feasible landward approach to the promontory, the defences consist of triple ramparts of soil and gravel with intermediate ditches; on the east side they are reduced to twin ramparts with a medial ditch. There may at one time have been a rampart and outwork around the perimeter of the promontory, except on the west, but there are now no visible traces. In any case, the encircling steep slopes would have afforded considerable natural protection. The interior of the fort measures 83m by 44.5m, and extends westwards to a spur crowned by the remains of a circular hut. Information from ‘Exploring Scotland’s Heritage: Dumfries and Galloway’, (1986). This fort is situated on a promontory on a degraded coastal escarpment set back from the beach in Larbrax Bay. 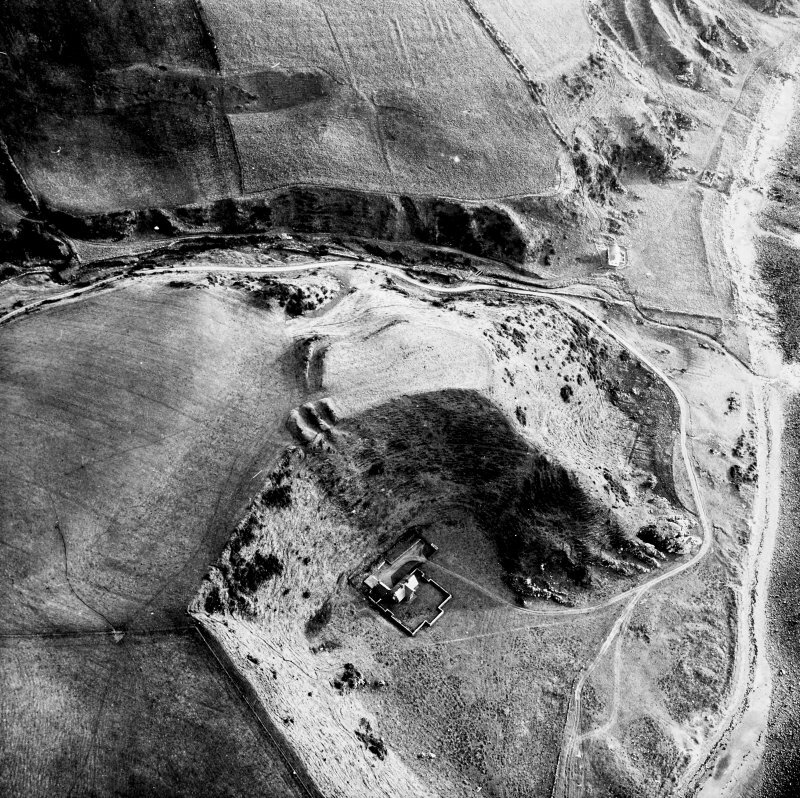 Its defences comprise up to three ramparts and ditches, which cut across the neck of the promontory on the NNE immediately NW of the entrance; SE of the entrance, however, only two ramparts with a medial ditch can be seen, while extending along the SE flank of the promontory these reduce to only a single rampart forming little more than a scarp above a broad level terrace cut into the slope. The interior measures 83m from NE to SW by 44m transversely, but apart from traces of rig and furrow it is featureless.